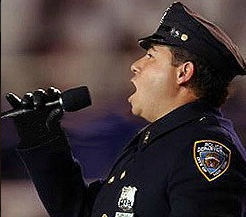 Price Rubin & Partners artist Daniel Rodriguez, aka the “Singing Policeman,” is slated to perform at the fifteenth anniversary of 9/11 “American Portraits” concert. The ‘American Portraits’ concert is not only a chance to honor the 2,977 people who lost their lives in the 9/11 terrorist attacks, but to hear America’s beloved tenor Daniel Rodriguez. Jack Price, founder of Price Rubin & Partners, is proud to announce his artist Daniel Rodriguez, the former New York City police officer who gave a stirring rendition of “God Bless America” in the wake of the 2001 World Trade Center terrorist attacks, will be performing at the fifteenth anniversary of 9/11 “American Portraits” concert. The Lebanon County Community Concert Association event is scheduled for Sunday, September 18, at 3 p.m. on the Lebanon Stage, 1000 South 8th Street, Lebanon, PA.
Daniel Rodriguez is known to many as “the voice that healed a nation.” Prior to that, at age 16, he presented his first recital at Carnegie Hall, and at 17 was billed as the “17-year-old Baritone.” Then, at age 19, Rodriguez put music aside to raise his family, going to work to make ends meet. He worked at the post office, and then as a police officer in the New York City Police Department. It was in uniform, however, that local New York audiences began to discover his voice and passion for the music he sang. As an “official singer” for the NYPD Ceremonial Unit, Rodriguez sang at many functions, and later at memorials in the aftermath of the September 11th attacks. After 9/11, then New York Mayor Rudolph Giuliani helped set up an audition with Placido Domingo, with whom Rodriguez studied, as well as the staff at the Young Artist Program in Washington D.C. for a year and half. His operatic debut took place in June of 2006, where Rodriguez sang the role of Canio in “Pagliacci” with the Chelsea Opera Company in New York City. In 2007, Rodriguez was named for “Best Performance by a Leading Male” for the 2006-2007 season by Opera Online for his portrayal of Canio with Granite State Opera. To purchase tickets for the “American Portraits” concert featuring Daniel Rodriguez and the Dallas Brass, please click here.